For me, parties and gatherings are all about the food. I mean, isn't that the whole point? So, when I plan parties I tend to obsess over the menu - and I mean OBSESS. Pinterest becomes my homepage and I write out at least 10 different iterations of the menu. Then, each potential menu item is recipe tested multiple times before it passes the test. And yes, all of the food at the party must be homemade, including the apple sauce, hummus, and za'atar aioli. As you can imagine, the few weeks leading up to our Hanukkah celebration was a delirium of latkes and other fried delicacies that, by the time the party rolled around, my soul reeked of oil. But it was all for great fun so #worthit. I made three different types of latkes for the occasion - Classic Potato Latkes, Sweet Potato and Apple Latkes, and Kale and Carrot Spiced Latkes. 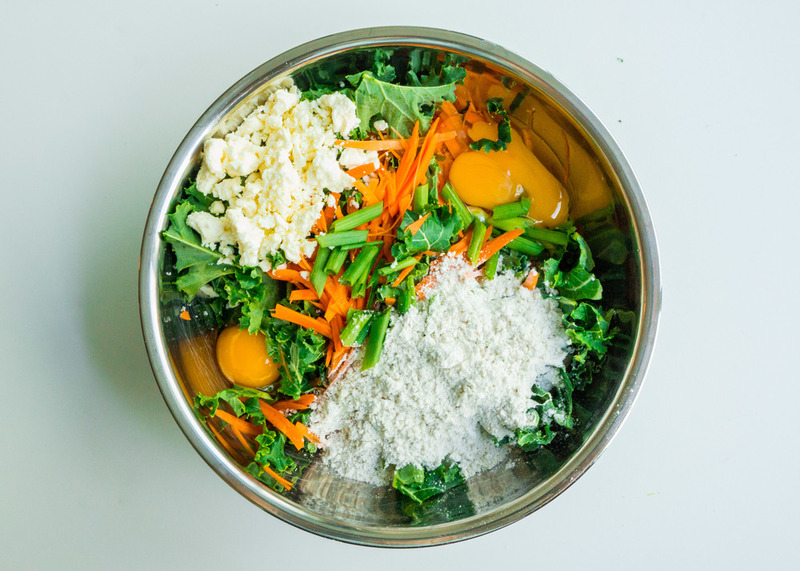 The clear party favorite was the Kale and Carrot Spiced Latke and I knew I had to share the recipe on the blog. They are unique with a bright pop of color and they balance out the heavy starchy carbs of the traditional latke. 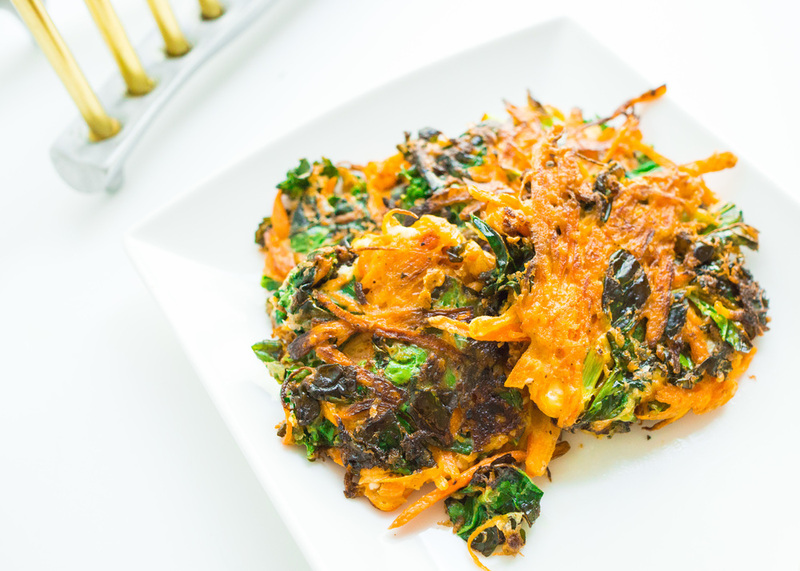 The curly kale crisps up into delicious bites of kale chips and the carrots offer a wonderful chew and earthiness to the latke. Crumbled feta is mixed in to increase the depth of flavor and add cheesy-goodness. They are definitely unconventional, but are so exceptionally good. To make these for the party, I used the shredded carrots from Trader Joe's. They come in a bag and are washed, peeled, and shredded, which makes my life a million times happier. I've also made them by hand grating the carrots, which works just fine, so choose whichever method you prefer. Carrot and the kale are not starchy like potatoes, so it might be a bit more difficult to form these into patties, but do the best you can and drop them into the pan. Once they start to fry up, they hold form pretty well and are easy to flip. Make sure to get the golden brown color on both sides, which will give the most amazing crispiness from the vegetables. Wash and peel the carrots. Shred the carrots using either a box grater or a food processor with a shredding attachment. Place shredded carrots into a large bowl. Remove the middle stem from the kale and roughly chop into 1-inch pieces. You want to keep bigger pieces of kale so that they crisp up like kale chips in the latkes. Add kale to the bowl. Roughly chop scallions and add to the bowl. Add the remaining ingredients except the coconut oil into the bowl and mix until combined. Heat up about coconut oil in a large skillet or cast iron pan. You want about 1/4 inch of coconut oil in the pan. Drop a small piece of the latke batter into the pan - if it bubbles immediately, the oil is ready. Form latkes into patties with your hands and carefully drop into the oil. Fry about 2 minutes on each side until crisp and golden. Drain the latkes on a plate lined with paper towels. Serve immediately and enjoy!